The 2020 Presidential election season is officially in play with more challengers running for the White House than Carter has pills. There are Democrats from the center, left-of-center and way left-of-center who are going to jam our email inboxes, social media accounts and mailboxes with propaganda that will lambast how America is being managed by the current administration, while promising the moon and real change in exchange for our votes. There is also a billionaire running as an independent, causing the liberal elites within the Democratic Party to go ballistic as they view Howard Schultz’s bid as likely to pull votes away from a Democrat and aid President Trump’s re-election. The campaign for the Democratic Party’s presidential nomination is becoming one big mosh pit of more than 11 contenders and counting. They are offering all manner of fresh tax-and-spend plans. They could just hold the first round of debates inside a circus tent, because that seems to be the most fitting venue. All tongue in cheek aside, within the radical left wing of the Democratic Party, the seeds of socialism are being sewn — and I view this development as dangerous for American society and the biggest threat to the secular bull market for stocks. The notion of open borders, no-cost universal health care for all, guaranteed income, student loan amnesty and free college education are all components of a utopian world view that would collapse the U.S. economy at record speed. I state record speed because the other side of that utopian outlook is that those same people want to raise taxes across the board by as much as 70% for top earners. What the party of socialists fails to understand is that the top 1% of income earners, or 1.4 million households, are already paying 39% of the total income tax bill now. The other 140 million filers that make up the rest of the 99% that pay taxes cover about 10% of the total tax bill. 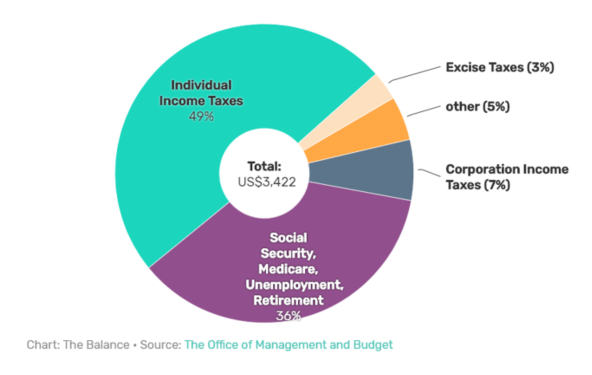 The figure that really sticks out, though, is that 76 million Americans, or 45.3% of adult heads-of-household, won’t pay any federal income tax for 2018, compared to 72.6 million, or 43.2%, non-income tax payers who headed households in 2016. So, going after the very few for more of their income, even though they already are footing the bill for close to 40% of the annual federal budget, seems to me to be excessive. And here is why: As several other European nations have enacted massive income tax increases, many of their wealthiest citizens have simply left and set up residency elsewhere. Sure, they still own and operate businesses in Paris, France, but have relinquished French citizenship and its high-income tax structure and relocated to Singapore, or New Zealand, or Switzerland or even Mexico. Figures compiled in the past few years suggest the world’s wealthy are more mobile than ever before and more willing than ever before to leave their home countries. More open economies, the ease of working digitally abroad and special citizenship or “golden visa” schemes for the wealthy helped record numbers leave and take up residency where their fortunes aren’t attacked by the socialists. I get it. The problem is that highly partisan politicians such as Sen. Bernie Sanders and Rep. Alexandria Ocasio-Cortez, who have ambitions of raking in hundreds of billions of dollars from those who already pay 39% of the federal government’s bills, actually have a foothold within the Democratic Party. Nothing is more mobile than a millionaire, and under enough pressure, they’ll leave and live in another country. For the rest of the one percenters who qualify under that name by earning $422,000 per year and decide to stay in the United States, I see two trends. The first is an expanded rate of migration to the seven states with no income tax (Alaska, Florida, Nevada, South Dakota, Texas, Washington, Wyoming, New Hampshire and Tennessee). And with the Tax Reform Act having capped the deduction for state income tax at $10,000, the urge to move will only intensify if Federal tax brackets are ratcheted higher. The second trend I see is the allure of qualified dividend income, which has a maximum tax rate of 20% for those in the 39.6% federal tax bracket. While bond interest and interest from other asset classes like certificates of deposit, money markets, Government National Mortgage Association (GNMA) bonds and real estate investment trusts (REITs) are taxed as ordinary income, qualified dividends on common stocks suddenly become much more appealing if an assault on high-income earners gains traction. In a New York minute, stocks with dividend yields north of 4% are going to be a big deal if the socialists find a way to tap a second or third pound of flesh from those who already do the heavy lifting for the U.S. tax bill. And leave no doubt that the 20% maximum tax rate for qualified dividends will remain intact, as there are just as many, if not more, liberal-minded millionaires than conservative-minded millionaires. The liberal elite are morally left leaning, but fiscally right leaning, which means the one percenters are made up about equally of Democrats and Republicans — and all of them love their qualified dividends. Against a backdrop of a slower economy, low interest rates and the prospect of future higher income taxes, stocks that pay qualified dividends are about to become the market’s belle of the ball.